This entry was posted on Friday, December 19th, 2014 at 7:49 pm. You can follow any responses to this entry through the RSS 2.0 feed. Both comments and pings are currently closed. * Way too much Bujold, and she didn’t even get to Chalion and The Sharing Knife. * Kind of a lot of Steven Brust. Let’s branch out. * I looked through the TOC three times and didn’t find Rosemary Kirstein. I learned about your books from Jo’s column. She wrote a glowing, enticing review and I have no idea why it is not in the book. It is hard to imagine a more positive review. You don’t have to comment on the last bit, though maybe I’ll throw a hissy fit and it will be in the trade paperback. There was rather a lot of Bujold, wasn’t there? But I think that the really devoted Bujold fans probably have no problem with that! Alas, I’ve just never managed to get hooked by Bujold’s work. I have no idea why — unless it’s that most of it seems to be military SF, which for unknown reasons rarely interests me. Plenty of people I know, whose opinion I trust, like military SF, and the Vorkosigan series in particular. 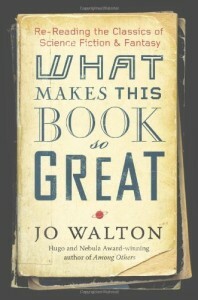 As for Jo’s review of my work not being included: I have no complaints! I’ve gotten a LOT of mileage from that review already. Who knows what drove the decisions of what to include and what to leave out of the book? There might be some really smart and compelling reasons for each of the inclusions, behind the scenes in the publishing world. Walter — I tried for months to make an index, but it was just beyond me. I didn’t want a crappy one, that’s less use than not having one, and a good one is just more work, and harder work, than I could do. In the end I just had to give up. For some reason, I just assumed that the index would have been created by the publisher, and not the author. Or some lower-level editorial assistant. On reflection, I have no idea why I assumed that. A list of the authors pointing back to chapters would be a big help. Titles of books and stories would also be helpful, but secondary. Indexing is not easy, my day job for the past fifteen years has been writing search engines. Not done yet. Walter – I agree with you that the lack of an Index to the book is unfortunate. There is, though, an online Index of all of Jo’s Tor.com columns, listed by author and title, with links to the online versions of the columns. I’m the maintainer of these pages. The online versions of the columns have a significant over the printed ones in that have many insightful and interesting comments attached! There’s a link at the top of the web page, ‘W.T.B.S.G.’, to a list of all of the columns in the book, but currently no way to see the authors & titles that are mentioned in the book. I will try to think of a way to do that, hopefully over Christmas.